Friedrich considers the Montaigne of the Essays on of the first "moralists" in the French sense of the term, recording with anthropological fervor and in fresh, informal language the full spectrum of human thought and commerce as he saw it. 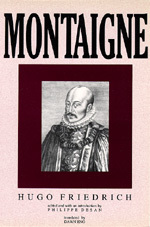 Philippe Desan, who introduces this fine translation, commends Friedrich's holistic interpretation of Montaigne's unstructured creation, so often reduced by critics to its smallest fragments. Friedrich, says Desan, evokes "an epoch, distilled from accounts given by the best witness of the Renaissance."